I'm going to ask you to close your eyes. (Not yet, or you won't be able to read the next bit!) OK, you'll close your eyes and focus your attention on your hands for a second or two. Don't move them, or wiggle your fingers; just focus your attention on them. After that, and still keeping your eyes closed, you'll move your attention to your shins. Again, a few seconds of focus. Ready? Go ahead. 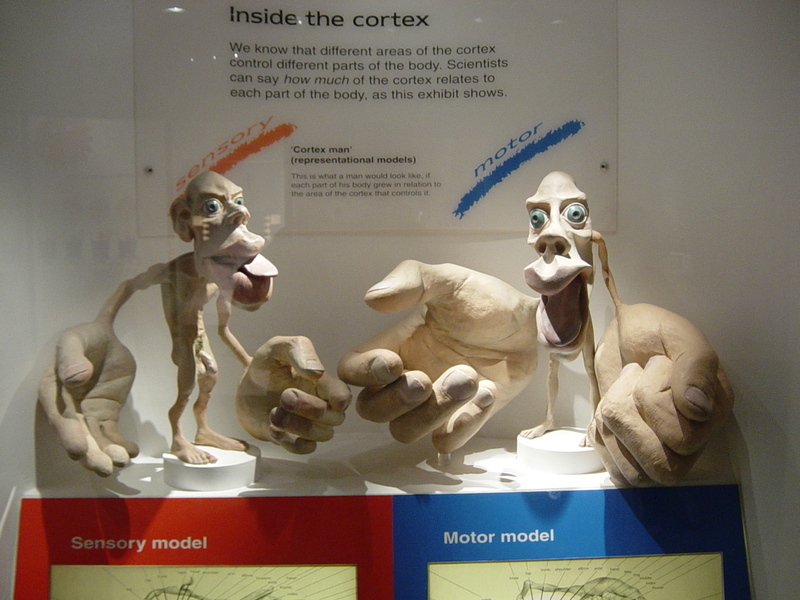 The size of each part of the distorted body of the Cortical Homunculus represents the number and sensitivity of nerves at that part. The Homunculus is what we'd look like to everyone else if we looked the way we felt. But of course, we don't look like that at all. Now in about two weeks from now, those of us visiting Anaheim are going to get a close up view of a remarkably similar phenomenon. However, instead of it being a distorted view of the human body, it will be a distorted view of what is really important in chip design and verification. DAC, the Design Automation Conference, is a VLSI Homunculus. Walk around the exhibits and you will see large booths and small booths; colourful booths and plain booths; booths that make you go "wow! ", and booths that make you go "oops, sorry, I thought this was the restroom". Look over there and you'll see booth 1349 -- Synopsys. You can't miss it, it's huge. It's always huge. Oh, hang on, there's another monster exhibit; number 2439. Why, it's Magma. And - wow, there's another. Mentor of course. They're at 2301. Of course, notable by their absence are Cadence. But being absent from DAC doesn't mean being absent. CDNLive, anyone? Now I can't tell you exactly what our big tool vendor pals spend on their booths, but it is way more than I spent on gasoline last week, and I drive a Nissan Armada and live in Texas (where journeys are only "long" if they're over 500 miles). And they do that because advertising like this works. It gets into the brains of the targets and makes them see the world differently from the way they would have seen it otherwise. In other words, DAC affects the way we see the world. The large marketing budgets of tool vendors are able to make you imagine that your hands are bigger than your shins. The problem is, just like the Cortical Homunculus, the VLSI Homunculus of DAC, while not completely wrong, isn't completely right either. It's distorted. To the unwary conference goer, the most important part of the VLSI design and verification problem, is tools. Choose the right tool, and you'll be fine. Get it wrong, and you'll never tape out a chip again. And languages; they are just as crucial. Vera, or e, or SV - better get that right too. Everything rides on the choice. But of course, if you can manage to open your eyes again, and try to shrug off the illusion, you'll realize what we all know deep down in our knowers. Of course tools and technologies are, particularly when we move through generations of those things (after all, Vera or e or SV are all superior to plain old Verilog when it comes to verification), important. But far, far more important are the knowledge, skills, experience, and artistry of the people who use those tools. Peopleware, not Software or Hardware, is the most important VLSI body part. After all, which would you rather have: a team of Olympic Gold Medalist Verification Engineers using Verilog and assembly code; or a team of newbies using e, Vera, SV, you name it? Looking forward to DAC. Looking forward to the Homunculus. But most of all, looking forward to meeting smart folks. Please say hi if you see any of the Verilab team.